Don't stop at bananas - Try dipping strawberries, oranges, blueberries, or anything else you're in the mood for. No popsicle sticks? No worries. Just be prepared to get messy! Place a popsicle stick in each banana half (if using). Place the bananas on the tray and chill in freezer for at least 10 minutes. Heat chocolate in the microwave in a microwave-safe bowl for 30 seconds at a time until melted. Stop every 30 seconds to stir. 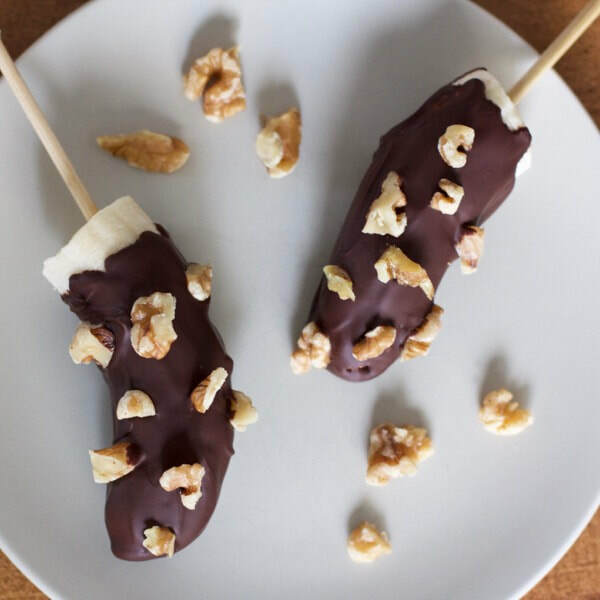 Dip the bananas in the chocolate. Use a spoon to drizzle the chocolate over, if it's easier for you. Sprinkle on nuts or other toppings as desired.